Uniform Plumbing Code / UPC Listed: Master Flash was used to create a new engineering standard for profiled roofing by the International Association of Plumbing and Mechanical Officials (for the Uniform Plumbing Code). 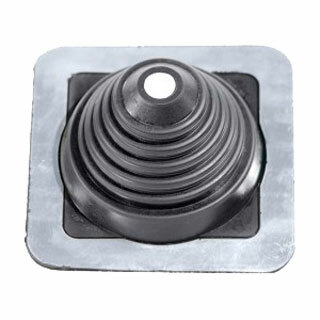 AC FLASHING BOOT SYSTEM, 3-PIPE EPDM TOP BOOT WITH ROUND EPDM BASE. FITS TWO 3/4 CONDUIT PIPES AND ONE 3/8 AC LINE.